There are lots of reasons why people don't eat eggs. Some people have an allergy and follow an egg-free diet, some people follow a vegan lifestyle and others simply don't like them. However, I do eat eggs, but this recipe using just chickpea flour is an amazing substitute for people who don't, for whatever reason. It's really tasty, filling, cheap and really quick to make too. And I now often choose to make this dish for lunch rather than use eggs. This recipe uses chickpea flour. I discovered this ingredient recently and used it to make gluten-free pizza bases. 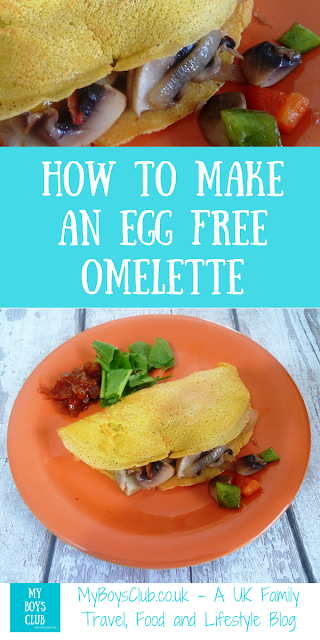 There were so good and tasty that I searched online for ideas for other dishes using this ingredient, and came across egg free omelettes. Chickpea flour, also known as gram flour contains high quantity of carbohydrate and no gluten. It is made from ground chickpeas and sometimes mixed with ground yellow lentils too. It is rich in fibre, iron, potassium, manganese, copper, zinc, phosphorus, magnesium, folate, vitamin B-6 and thiamine. As well as being gluten-free it is also high in protein. I love chickpeas. They are high in fibre, protein, and antioxidants and are low in fat. 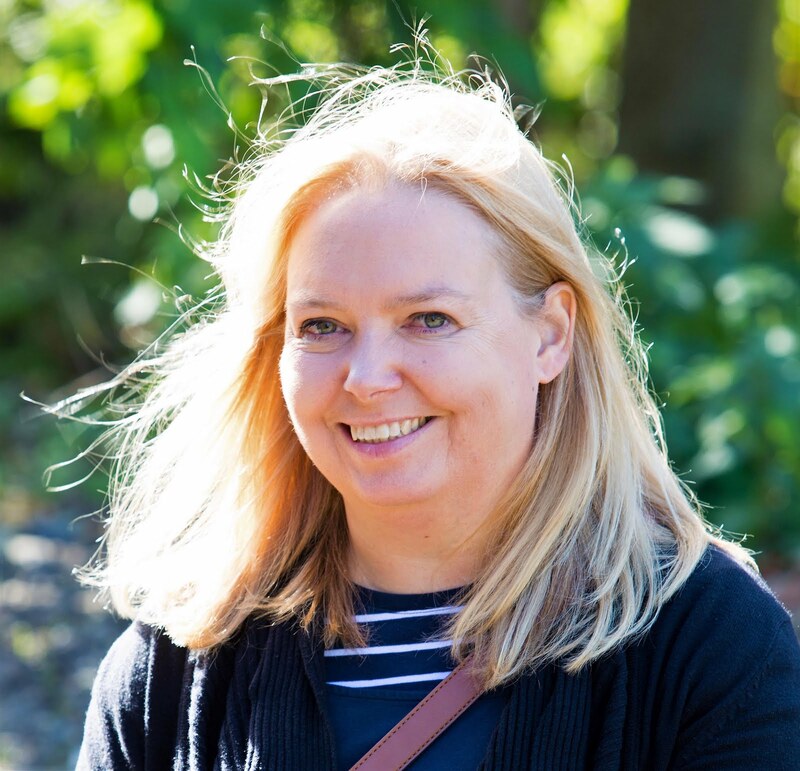 I often use them in cooking – from curries to chocolate spread - honestly! Nutritionally both are pretty good for you. I would usually use at least 2 in an egg omelette so that's about 150 calories and 14g protein, 10g fat and 3g saturated fat. In a chickpea omelette, I use 50g chickpea flour per omelette, so that's approximately 193 calories, 11g protein, 5.5g fibre, and 3.5g fat with less than half a gram of saturated fat. Both are then cooked using oil and have added fillings. So there is no need to miss out if you can't eat eggs. 1. Weigh out 100g chickpea flour and put it in a bowl, making sure to break up any lumps. I stir it with a handheld whisk to do this. 2. Add 250ml of water and stir well. 3. Add oil to a non-stick frying pan and gently heat. 4. Gently fry the vegetables until soft, remove from pan and set to one side. 5. Add half the mixture and coat the whole of the bottom of the frying pan, and leave to cook gently. Ease the mixture from the sides o the pan as you go. 6. After a few minutes, when the bottom is starting to set flip the omelette over to make sure both sides are cooked. 7. Add your choice of filling, fold and serve. I added leaves and homemade chilli tomato chutney too. This really is a quick easy, tasty, nutritional lunch which is not only dairy-free, gluten-free, and vegan but suitable for anyone to eat whether you have an egg allergy, choose not to eat eggs or simply have run out of them. Have you tried egg free omelettes? 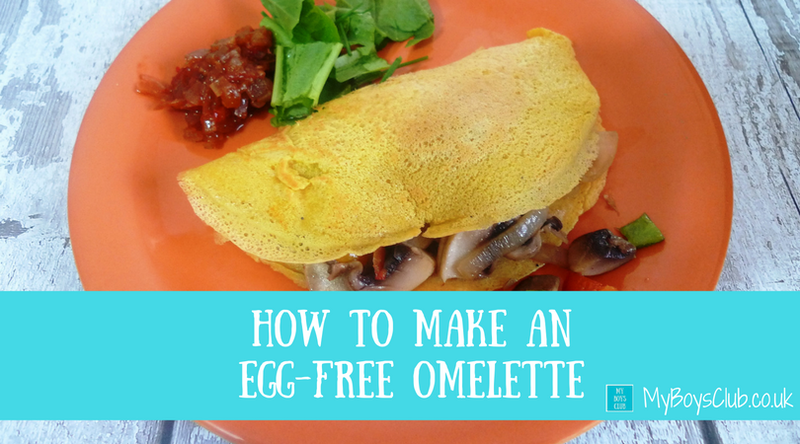 What a great way to still have 'omelettes' when you're egg and wheat-free. Gram flour is so so good. We use it for bread here :) Thanks for joining in with #FreeFromFridays. Egg free omelette...oh my days...you know how fussy I am with my food lol this looks lovely though and I'm trying new things at the moment so I'm gonna give this a good go! wish me luck!